Oven Baked Pulled Pork Flautas with Avocado Crema + $100 Visa Gift Card Giveaway! 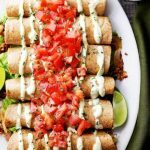 Diethood » Home » Oven Baked Pulled Pork Flautas with Avocado Crema + $100 Visa Gift Card Giveaway! Oven Baked Pulled Pork Flautas with Avocado Crema – Flavorful BBQ pulled pork wrapped tightly in baked flour tortillas and served with an incredible Avocado Crema. What’s your favorite deliciously quick weeknight meal? Tell me in the comments for a chance to win a $100 Visa gift card! These, my friends, are Pork Flautas. Some might call them Taquitos, others might say neither Flautas nor Taquitos, but wrapped-up Tacos. However, it doesn’t matter what we call it because, reality says: this dinner-game is called, “How can I create a weeknight meal with authentic, fall-off-the bone BBQ pork, ready in minutes?!”. To which I say, GAME ON! Essentially what these Oven Baked Pulled Pork Flautas are all about is a good hearty stack of Tony Roma’s Tender & Juicy Pulled Pork mixed with garlic and onions –> then stuffed in flavorful whole wheat flour tortillas -> then rolled up and baked to a delicate crunch because that just makes them over-the-top awesome. It’s like tacos meets convenience meets authentic American BBQ meets ease. I just get so happy when those four things come together. Too, too often I come home, feeling rushed after a game of soccer, or cheer practice, or a lazy pool day, and the last thing everyone wants to wait for is a two hour meal prep, garnished with a side of delicious and complete satisfaction. Besides, let’s be real – my family’s favorite food does not equal microwaved tofu with zoodles. BUT, authentic BBQ goodness is something we all DO get behind -> Enter: Tony Roma’s. Their authentic, slow-smoked meat makes it easy for our family to enjoy authentic BBQ goodness without the stress or messy prep, and we’re always just minutes away from enjoying BBQ perfection. Plus, it goes with anything. It’ easy to pair with any sides – coleslaw wins every time – or stuff it in some flour tortillas, as we did here, and enjoy a great, easy and everyday dinner solution as a result of high-quality pre-cooked meat found in your grocer’s refrigerated section. We’ve tried each and every one of these, and they are all finger-licking-fantastic. The taste of restaurant-quality BBQ made right at home. Bonus? The unique ready-to-bake plastic smoker tray that their meat is packaged in! Microwave, oven and grill ready, just cook and serve! You should also note that these Flautas with Tony Roma’s Pulled Pork are about to become your family’s new favorite din din. These are no joke. There’s just a lot of goodness packed into this one recipe. It’s life-changingly easy, yet sweet, and smokey, and so darn good. In my perfect world, I would have a container of this pulled pork in my fridge at all times. Oh wait. I DO! I live for food like this. P.S. Don’t forget the Avocado Crema – it’s the best creamy dip you will ever have. For more information about Tony Roma’s, you can follow them on Facebook and on Pinterest. Tony Roma’s products are available at grocery stores and club stores such as Walmart, Costco, Safeway, Albertsons, Krogers, Smiths, Stater Brothers, and Save Mart. Oven Baked Pulled Pork Flautas with Avocado Crema - Flavorful BBQ pulled pork wrapped in baked flour tortillas and served with an incredible Avocado Crema. Lightly grease a 13x9 baking dish and set aside. In a large nonstick skillet, heat the olive oil. Add shredded pork and season with cumin; continue to cook for 8 minutes, or until heated through. Warm the tortillas in the microwave for about 30 seconds so that they're easier to roll. Add pork mixture to each tortilla and roll it up tightly. Transfer prepared tortillas to the previously prepared baking dish, seam-side down. Lightly spray the tops of the rolled up tortillas with baking spray. Bake for 13 to 15 minutes, or until tops are lightly browned. In the meantime, prepare the Avocado Crema. Place all of the ingredients in the bowl of a food processor; process until smooth, stopping and scraping down the sides of the bowl with a rubber spatula as needed. Transfer the crema to a small bowl and set aside. Layer the shredded romaine lettuce on a large platter. Arrange the prepared flautas over the lettuce. Top flautas with chopped tomatoes and serve with a side of the prepared Avocado Crema. yum, these flautas sound like a must make – as for favs, hubby would probably say my sloppy joes or my creamy chicken enchiladas – for me it might be my seafood gumbo with a salad and crusty baguette! For a quickie meal, I make sloppy joes. I like to broil salmon for a healthy quick meal. My favorite deliciously quick weeknight meal is making a really cut thin Steak that is per-mariniated with Worcestershire Sauce. We like making tacos or tostadas with hamburger or shredded meat leftover from earlier meals. We love chicken, pineapple, onion and shredded potatoes cheesy enchiladas! Super quick, easy and delicious! I always have homemade frozen meatballs on hand. I package them in Foodsaver bags that you can drop right into boiling water, so they reheat while the pasta water comes to a boil and the sauce heats up. Add some bread and dinner is done!!! My favorite quick meal is cheese quesadillas. So good and yet so quick! My favorite quick weeknight meal is Korean Beef. I used ground beef instead of steak and serve it over rice with veggies. Super easy and at least decently healthy! My quick weeknight meal is burritos. Spaghetti and meatballs is easy peasy for me. I have a chicken tortilla soup that I can throw together pretty quickly. My family loves it! I posted a tweet: https://twitter.com/FireRunner2379/status/810570994238758913. My favorite quick weeknight meal is Brinner! Whether its waffles, French toast or pancakes the kids always gobble it up. We all love breakfast food and always have the ingredients on hand…I mean its just flour, sugar, salt, baking soda, eggs and milk! Frito Pie is my family’s favorite quick meal. My kids love tacos, and we eat them a couple of times a month. We are big fans of barbeque as well! We love pulled pork or carne asada in baked yams with black beans, salsa, cheese, avocado and sour cream. My favorite quick and delicious weeknight meal is spaghetti and meatballs. I have my sauce and meatballs already made and just boil the spaghetti. Quesadillas and something easy like sweet potato fries. Pizza using those kits you can buy at Costco! Rotisserie chicken is the perfect shortcut for chicken tacos. my favorite quick weeknight meal is bbq chicken w/ veggies! I usually go for pasta, or taco salads. Well I think this might be my new fave! I usually get a rotisserie chicken and make chicken salad for a quick meal. Chicken stir fry is always a hit. So is chicken quesadillas! My fave quick go to dinner is turkey tacos! One of my favorite quick go to meals would be tacos. I make ground beef and season it with homemade taco seasoning. Then I will set up crispy taco shells, tortillas, toppings and we can each customize our own. I make pasta with tomato sauce,Italian sausage and diced zucchini for a quick weeknight meal. If I have time I also make garlic bread for a special treat. an omelet is quick and a great dinner. My favorite quick recipe to make during the weeknights would probably have to be my husband’s favorite: Chicken and Noodles. I just chop and season some chicken tenders with garlic salt, garlic powder, basil, some black pepper, and then cook it stove-top. I add some chicken broth once the chicken is finished, bring to a boil, and then cook the egg noodles in the liquid. They absorb the flavor wonderfully! Sometimes I’ll add some carrots and/or potatoes. It’s quick & easy to throw together! Baked ziti is my quick go to meal! Veggie Scramble with eggs and whatever vegetables we have on hand is our go-to quick dinner. Bean burritos are one of my favorite quick dinners! My favorite is chicken alfredo using rotisserie chicken. My favorite is angel hair pasta with spinach and white beans. A quick, fun meal would be homemade pizza. I throw together a one pot rice dish. It’s a great way to use up any leftovers or veggies that need to be cooked before they go bad! Oh my word, I’m hungry now. This recipe looks amazing, as do the ribs and other products pictured above. My go-to quick weeknight meal is usually sloppy joes. Love TR! Hope to find in my stores. If I’m really ready pushed I make breakfast for dinner. If slightly rushed nothing better or easier than a roasted chicken! My favorite deliciously quick weeknight meal is vegetable stir fry. I like spinach ricotta pasta for quick weeknight meal. My favorite deliciously quick weeknight meal? The one that I don’t have to cook or clean up the kitchen afterwards..
My favorite is salad with sliced cold chicken. Thanks so much. My favorite weeknight meal is “tuna stirfry”… stir-fried veggies, coconut aminos, and a few cans of tuna! Tuna casserole is quick, easy and so delicious and I make it when I have little time and slot of left over rice. Sloppy Joe’s are easy to make and taste so good! My favorite quick week night meal to make is stir fry over rice. The family loves when I put chicken and taco seasoning in the crock pot. Our favorite lately is falafel sandwich in pita, it’s fairly quick with the boxed version of falafel and is so delicious! My go to quick meal is to buy a roaster chicken, marinate it with Mojo (Goya) overnight or at least starting in the morning. At about 4pm I take it out of the marinade and throw it in a roasting pan at 375. By 6pm you have an amazingly crispy and delicious meal that goes perfect with a salad. Mmmmm…..those flautas look amazing Yum. My go-to meals are spaghetti and teriyaki chicken and rice. I like to make Brazilian beans and rice for a quick meal. I like to make chicken pesto pasta. My wife found this fish tacos recipe that is quick, easy, and so good. Even quicker if you make the peach salsa the night before. When in doubt, I make pulled chicken or grilled fish. Easy, simple, and eaten up. After reading this, ii made it for my husband and myself, so now this iis our new favorite. Delicious. Thanks so very much for sharing. The whole family loves my moms sloppy joe recipe! I want to devour this plateful of goodness! Such a delicious recipe! Frozen pirogi, takes about 15-20 minutes, yum. Whip up a small side salad and ‘ya have a meal. I generally have left over pasta frozen and some sort of sauce that can be thawed. We also like canned tuna tossed in our salad. I can make a very quick spaghetti sauce or I find it easy to whip up a fancy salad. I’ve seen the Tony Roma’s products at Costco, I will have to pick some up. My husband and daughter like when I make a box of pasta and toss in some sautéed diced chicken breast. I toss in some olive oils and a bag of frozen mixed veggies. I like making stuffed poblano peppers in the microwave! Stuff the peppers with a mixture of refried beans, salsa, and brown rice and just pop em’ in for a few minutes. Then – pure bliss. I like broiled fish and steamed veggies. I love to cook rotisserie and a salad yum!! Broiled chicken breast, baked potatoes, artichokes with butter. My favorite quick and delicious weeknight meal is spaghetti. I like to make some veggies and put those in my tomato sauce and then top the spaghetti with the veggie loaded sauce. It’s so good and easy. I also make some garlic bread to go with it and a salad. My favorite easy meal is ground turkey lettuce wraps or anything Crock Pot since my husband usually does that! This pulled pork looks delicious! For a quick meal I like to do a stir fry. I keep frozen veggies and a jar of homemade stir fry sauce on hand, so dinner can be out of the wok in minutes. I buy a rotisserie chicken, pull it and use it in a stacked enchilada casserole. We cook a large meal either in the crockpot or on the grill on Sundays and eat that for dinner the whole week. My favorite is pulled pork. I make something in the crcokpot 2-3 weekdays. Pork tenderloin is one of our favorites. My favorite delicious weeknight meal is burgers. I buy a rotisserie chicken, pull it, and stuff it into pitas! Under the official rules, it states that only legal residents of the fifty (50) United States and the District of Columbia who are eighteen (18) years of age or older are eligible. My favorite quicky meals are anything in my crockpot. However, if I forget then a simple soup and sandwich will suffice. My quick recipe is Shrimp sauteed in butter and garlic, pour it all on linguini and top with your fave cheese. With us it is Parmesan. Thanks for the great giveaway. I really like making quick tacos or lemon salmon and rice! Oh wow, these look killer! That avocado crema sounds amazing! Girl, you had me at avocado crema. I am gonna be all over these. I am also going to come by your house for dinner haha. I love crock pot enchiladas! My favorite delicious weeknight meal is shrimp or chicken stir fry with brown rice! We make a meal we call bean slop with baked beans, ground beef, onions, and diced tomatoes. Very easy and quick. My favorite delicious weeknight meal is a classic veggie pizza with chilli peppers! I love a great Greek salad! I love meatballs in the crockpot! Chicken breasts, veggies, and a salad. My favorite deliciously quick meal is Tater Tot Casserole. I call them delicious, easy, and DINNER! We like to have pancakes for dinner on a busy night. Making the Zucchini meatballs tonight! So many good things on your page! Thanks sooo much for those kind words, Cathe! I like pasta with olive oil, garlic and veggies. I do an amazing and quick broccoli cheddar “mac” and cheese with quinoa. Cook up the quinoa and broccoli in the same pan with broth or stock and some spices, and, when it’s cooked, grate a ton of cheese on top! Also, the OFFICIAL RULES link is a broken link, a 403 access denied error. Just letting you know! I love breakfast for dinner! I’ll make an egg white scramble with sauteed onions, mushrooms and turkey sausage with some light cheese or sour cream and cilantro and roll it up in a whole wheat tortilla. YUM. My recipe is for a quick 30 minute meal that my family loves called Cheesy Taco Lasagna. I use no boil lasagna noodles to make a quick dinner. Tacos are so easy and good! Chicken and Multigrain Rice, just cook some chicken with salt and pepper, cook the multigrain rice on the stovetop, mix and service. Delicious.